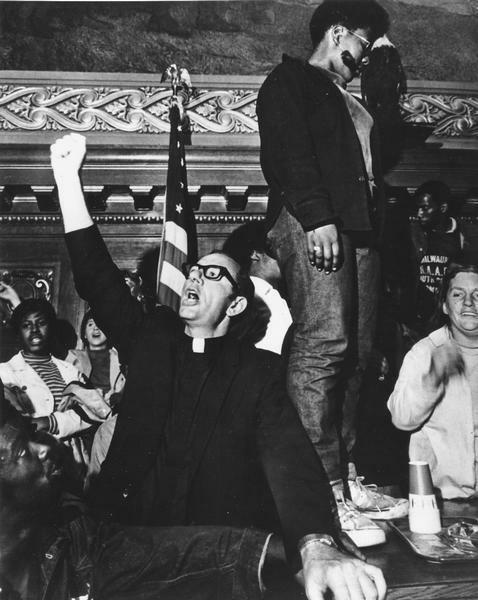 Father James Groppi with his fist in the air at the Wisconsin State Capitol during welfare demonstrations. He is surrounded by other protesters. The Assembly Chambers were occupied for 17 hours to protest the budget cuts to welfare recipients. Father Groppi was later sued for up to $15,000 for the damage done to the Assembly Chambers during the protest. He was also put in jail for contempt of the Assembly charge, and faced a State disorderly conduct charge.